Designed to be used with standard backcans, the Control 26-DT is a coaxial low/high frequency driver assembly, with a network and transformer. Without a dedicated backcan assembly, the Control 26-DT is applicable for new construction in which installation of the backcan and wiring must be inspected prior to the final completion of the finished ceiling. The Control 26-DT can also easily be used as a retrofit loudspeaker in cases where standard backcans and 8-inch ceiling speakers were previously used. 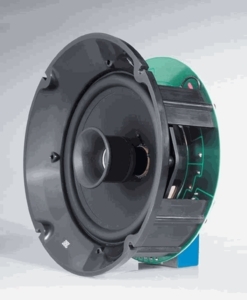 The low frequency driver has a 6.5-inch polypropylene coated cone for reliability and long life. The high frequency tweeter diaphragm is coated in titanium and the tweeter is diffraction-loaded for optimum pattern control. In a can with a volume of 0.25 ft3, the Control 26-DT has a sensitivity of 89 dB (1 W @ 1 M) and low frequency extension down to 70 Hz. The line distribution transformer has 70.7 V taps at 60 W, 30 W, 15 W and 7.5 W, and 100 V taps at 60 W, 30 W, and 15 W.